For many expatriates, the UAE is seen as a safe and secure place to earn a good living and enjoy a great quality of life. It is generally understood that as long as you respect the local laws and culture, expats can live in harmony with the locals, but most choose to keep a comfortable distance. After graduating from high school in 2001, Omar went to Switzerland to continue his education and landed an internship in Barcelona thereafter. 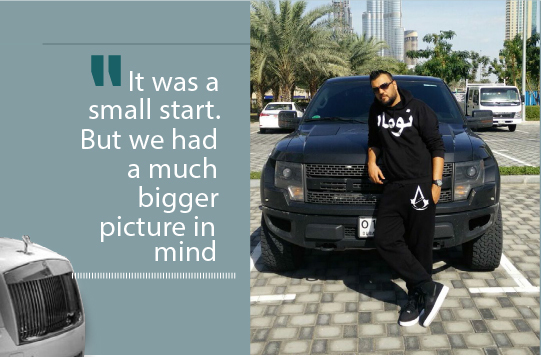 Soon, Omar decided to return back to Dubai where he hoped to start his career- “This was a great opportunity to learn how the world works and to take back some lessons with me to Dubai” he recalls. Upon his return, Omar got into the booming Dubai real estate market. During this time, Omar reconnected with Qassim and opened up a real estate company in 2009 that would go on to manage an impressive portfolio of local properties. This would be their first official, registered company they established together. In November 2012, the two scraped together whatever savings they had to open up a small service centre they called “Diablo Mechanics”. The shop targeted high-end car owners, offering them full service care packages that included cosmetic work and art decals. Qassim had studied Mechanical Engineering in the US and so with his background in engineering, meant the pair had some of the essential know-how required to set up a garage. Qassim understood the basics, but it came down to their love for cars and growing up in the UAE that enabled them learn what people wanted… Next, they just had to figure out how give to them! “It was a small start. But we had a much bigger picture in mid.” Omar reflects.“Within six months, we had grown out of our locations. We could not fulfil all the orders we were getting and had to move to a space double in size. And with this new space came more space for creativity and out of the box thinking! We rebranded as ‘Foil X’ and started experimenting with car wraps. Wraps, or Foiling, was trending at the time. People have a lot of wealth here and enjoy personalized luxury goods. 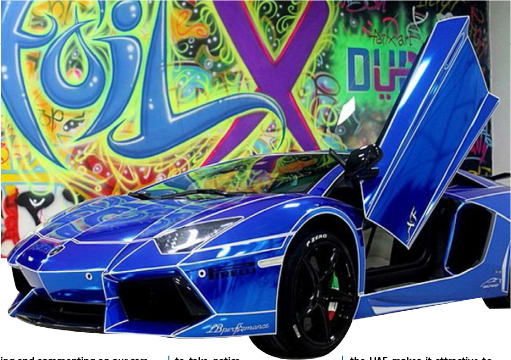 So, since owning a Lamborghini is not that uncommon, what do you do to stand out? You get your car foiled! And we were always one step ahead of everybody else in terms of creativity and design ideas!”Omar recalls in an enthusiastic tone. Recounting the story, Omar goes on to tell us: “Foiling was picking up at this time, and we decided to take advantage of this. So rather than outsourcing, we decided to open up a Foiling Division with 3 designers on board and invested in a printer equipped with a laser cutter for printing large stickers and foil to use for vehicle branding. This was something that many other garages were not doing. Paint booths are expensive. But we managed to get one on instalments and began to take on small projects. Within the first year, we had so many different kinds of projects andservices lines that we had to take a step back”. But they didn’t stop there. Social media clearly had a profound effect on interest, and Omar tells us “People were sharing and commenting on our cars and we would see this translate into business all the time. We were getting about 1000-1200 likes every time we posted a picture. 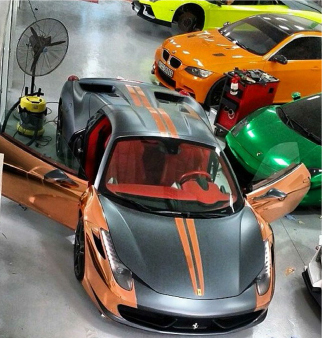 When we sold in 2015, we had 34,000 followers on Instagram!” Omar tells us how the brand grew and grew, “We initially had our brand @FoilX on some of our favourite projects, with permission of the customer, which would be then seen by these car spotters who would take pictures and upload them online and mentioning us. We even had some people ship their cars to us from oversees for a foil job, adding to the Foil X frenzy.” Inspiring stuff! Omar attributes the team’s main strengths to their network of contacts and a great understanding of the local market. Growing up in the UAE, the two had a large network of like-minded friends. “Our friends were among the first to try out our new foil designs, and once their cars were back on the street, people started to take notice and ask about us. From there, it just kept growing and growing.”One of the biggest publicity boosts came earlier on when Top Gear contacted them to supply cars for an episode on Dubai’s luxury car lifestyle. “After Top Gear, the rest just came forward. 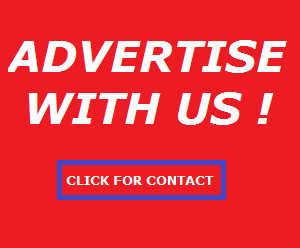 We were contacted by Gumball 3000 (UK Based International Rally Organization) and other international brands and we were getting great local contracts as well, such as Skydive Dubai and members of the Royal Family!”Omar adds, spiritedly.